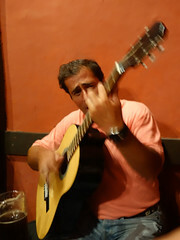 it’s a form of entertainment in various Spanish-speaking countries that combines folk music, food, and drink. 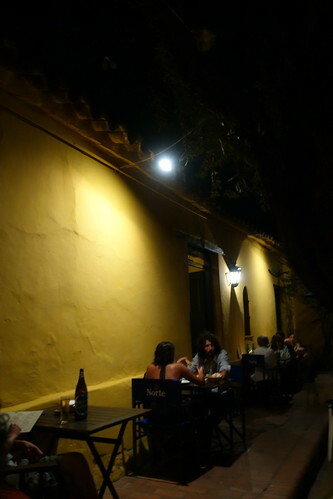 Salta is particularly famous for them — i was told that what tango is to Buenos Aires, peñas are to Salta by my Buenos Aires Airbnb host, and that i must go to one. 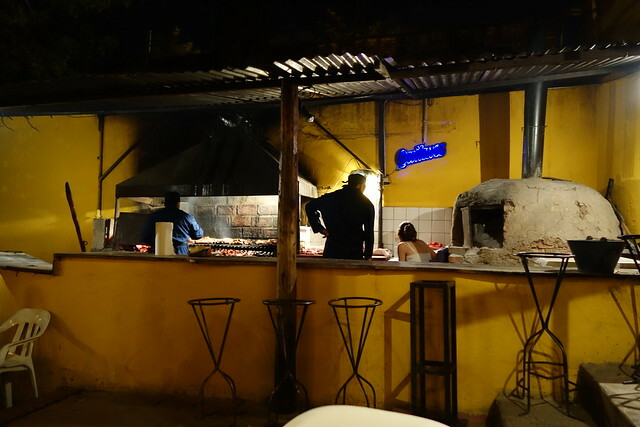 located on the west side of Salta, it’s about a five minute cab ride or so from the Plaza 9 de Julio; it shouldn’t cost more than 20 or 25 pesos. it has a central courtyard (referred to as the patio) surrounded by individual rooms, and an outdoor deck in the back. 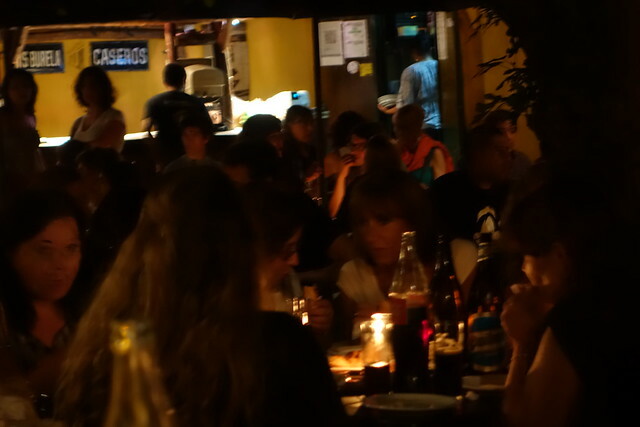 each of these is packed with tables for people noshing on yummy parrilla. One side of the patio, when it wasn’t yet busy. when you arrive, make your way through the two rooms you hit until you get to the courtyard; that’s where the employees congregate. keep in mind it doesn’t open until 9 PM, and reservations for the patio are hard to come by past 10 PM unless you call in advance, especially on weekends (i tried to make one on a friday afternoon for that night and was not successful). i chanced it and got there around 9:30 and got one of the few remaining two-tops at the patio. while the vast majority of the patrons were locals (with strollers and kids running about, even), i was seated next to three people from Australia who also did not make a reservation. English is somewhat spoken. The patio later on in the night, busy with people. NOTE that the fun (= the music) on the night i went didn’t start until 10:30-11:00 PM and i don’t think it was even in full swing by the time i left past midnight, so you may want to nap in the afternoon, eat something in the early evening to tide you over, and then draw out your dinner, which actually isn’t hard to do because as the night goes on, it gets overflowing with people and the staff gets overtaxed. (no complaints, since i was able to keep my coveted patio table for quite a while.) the music actually started in some of the side rooms and no one was playing in the patio by the time i left, so be sure to walk around and explore all the rooms you hear singing and music coming out of after your meal. there’s no problem just standing to the side and enjoying. you can even pre-eat and get there past midnight and hang out with a drink (or without?). i totally overate. 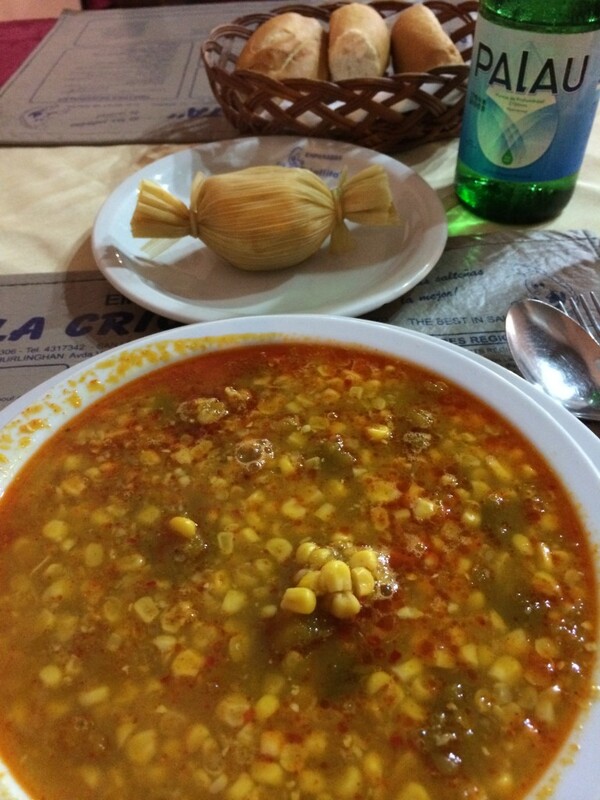 they have typical parrilla stuff as well as local specialties. 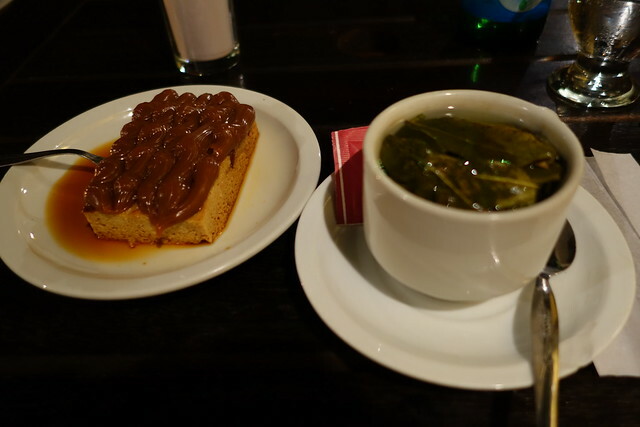 the total of all of my food and drink below was around 220 pesos. Nothing beats meat cooked over coals. My table was right in front of the barbecue and damn it smelled good. The only drawback was that you got to see what goes on behind the scenes, like blowing noses and eating food with hands — and then not washing after. 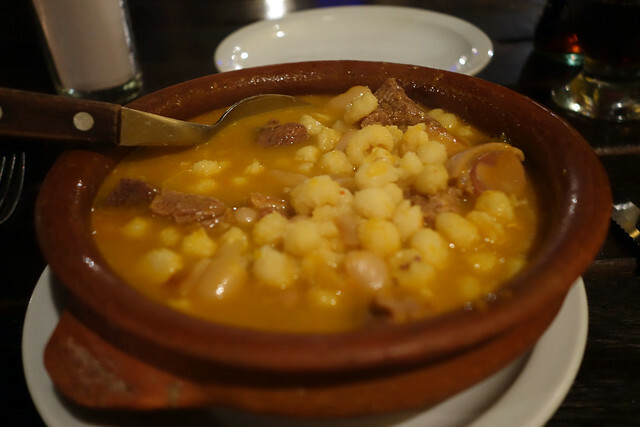 Having tried guaschalocro last night, i tried original locro, a heartier and more filling version, tonight. I wasn’t expecting hominy (at least, I think that’s what it was), but it was pretty good. Next time I’ll go with the guaschalocro because I’m a corn fan. Typical parrilla stuff, but THAT MEAT WAS SO GOOD, maybe the best I’ve had all trip. 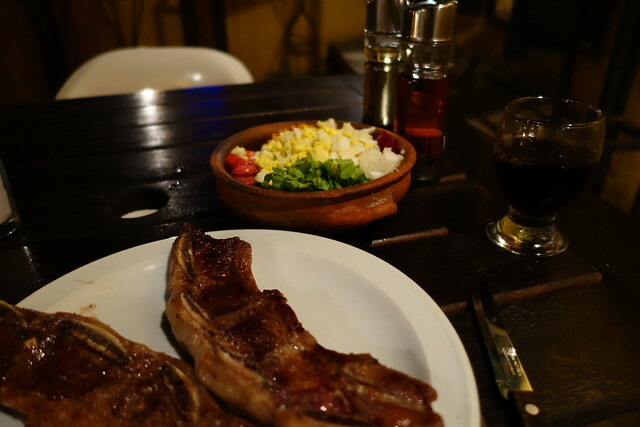 I forgot which one it was since I had the waitress pick for me, but it was second on the parrilla list (with a salad since I’ve been so carnivorous here). And if you’re wondering, that’s a Coke Zero, of course. i probably lingered at my table for nearly two hours (yes, quite selfish), and one of the customers was trying to get me to join his table, i think to help the restaurant out with customer flow, which i finally did when i was done eating. that’s why i was so close for the first part of the video below — i guess i’m kind of glad it worked out that way, although i felt kind of awkward. people just show up with instruments (guitars, drums, flutes, whatever), some solo, some in groups, find a seat, and start playing. i’ve heard that many now-famous folk singers have gotten their starts in peñas, but it’s not just them that are making music. the audience sings along so it’s not just a show, it’s a shindig. it’s also not like those fancy restaurants where musicians come by your table and serenade you expecting tips — these people are singing because they want to have fun and they want you to have fun. if you get a chance to go to one of these more intimate type of peñas, GO. i mean, how can you say no to great music and great food? 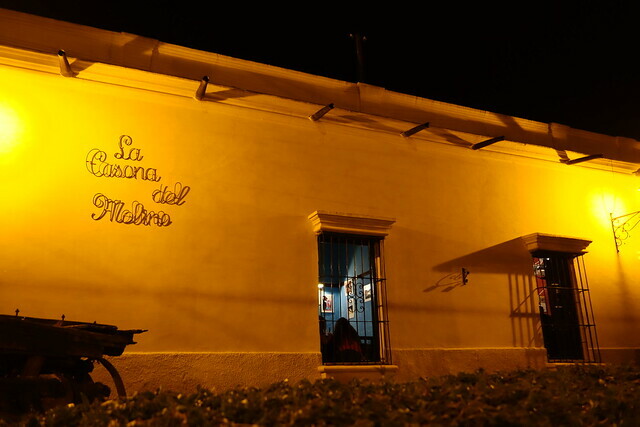 Be the first to comment on "A Night at La Casona del Molino, an Argentinian Peña in Salta"